For the second time, the Colombo Plan Staff College (CPSC) was made a technical partner in the 6th National Summit on “Education, Employability, Employment and Entrepreneurship (4E’s) and Education Awards held at the IC & SR Auditorium, IIT-Madras, Chennai from September 20 to 21, 2017. 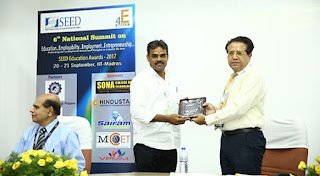 The summit was organized by the Society for Educational and Entrepreneurship Development (SEED) and tapped the partnership of several institutions in the state of Tamil Nadu. It was modeled with four themes namely the (1) Quality in Technical Education; (2) Sustainable Institute Industry Partnership; (3) Convergence of "Digital India", "Skill India", "Make in India" and (4) Responsible Research & Innovation based Entrepreneurship. The four themes provided an opportunity for TVET leaders, entrepreneurs and innovators in India to present their papers to the audience and experts attending the summit. The event is also highlighted by the SEED Education Awards “to recognize the Institutes, Industries & Individuals who have significantly contributed for upliftment of the society through 4E's”. Dr. Dhameja (right) being presented with a plaque of appreciation from the theme’s moderator. CPSC was represented by the Director of the National Institute for TVET Teacher Training and Research (NITTTR) Chandigarh, Dr. Suresh Kumar Dhameja. He presented a paper under the Responsible Research and Innovation-based Entrepreneurship theme in which the rest of the members discussed topics such as the attributes of a successful entrepreneur, challenges in entrepreneurship development, correlation between education and entrepreneurship, grass-root Innovations-based entrepreneurship, incubation labs, startup India, Angel Funding, government initiatives & other policies on Micro, Small and Medium Enterprises (MSMEs).